Finally! A DIY! And it's an easy and very cute one. Because really, that's what I want in a DIY; it's easy to make, doesn't take a lot of time, and the end result is adorable. Check. Check. Check. So, Valentine's Day coming up, which is exciting to me. People tend to get really bent out of shape about Valentine's Day, stating it's just a holiday made up by greeting card companies and it causes some single people to get upset. I really don't agree. It's just a time to spread some love to your friends and family, maybe buy yourself something special, and eat candy. I try not to think too far into things like holidays. They're suppose to be fun. A change from the everyday. And that's how I treat them. My wardrobe doesn't involve a lot of red or any pink. I'm just not a red or pink kinda lady. So I thought I would dress up some fun flats to wear during the next week. Spreading the love one step at a time. For this projects you'll need a pair of cloth flats (mine are $17 from Target), felt in the color of your choice, scissors, and fabric tac. Start by cutting out a square of felt that will fit on the front of your shoe. Then fold that square in half and cut out half a heart, just like your making a Valentine's Day card in elementary school. Basically a backwards C.
Use the heart you made to trace another heart. Two shoes, two hearts. Apply your fabric tac to the felt heart. This is a sightly annoying process, because the fibers of the felt will start getting stuck to the nozzle of the glue bottle, but push through. Make sure to go all around the heart, and fill in the center a bit. 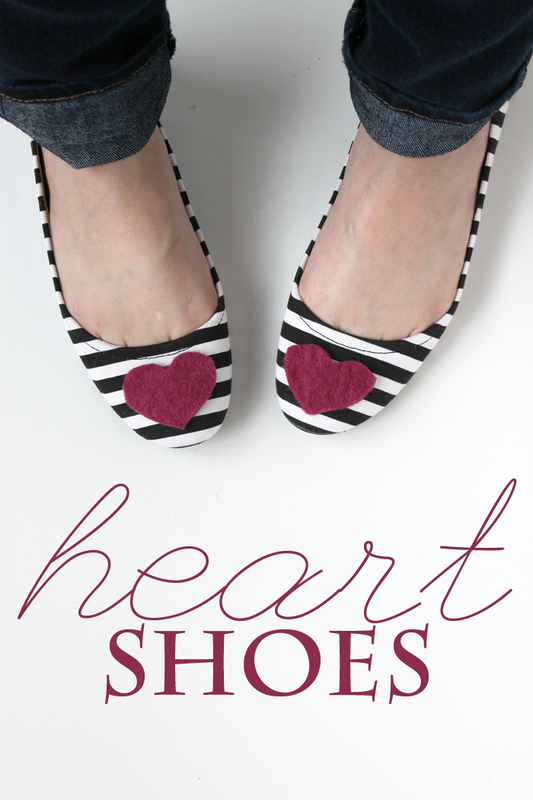 Press the heart, glue side down, on the front of your shoe and let it dry. And you're done! New shoes in 10 minutes max! Now, obviously these shoes aren't going to hold up forever. And you probably shouldn't wear them in the rain. Or if you live near me, in the snow. But they really are fun and perfect for when you need a little pop in your outfit!